Gerhard Marcks (German, 1889 – 1981) / Jenaer Glaswerk Schott & Gen. (Germany, founded 1884). Sintrax Coffee Machine designed ca. 1925. Heat-resistant borosilicate glass, steel, wood, and rubber. 10.5 x 8.5 x 5.5″ coffee pot and filter. Kamm Collection 2015.16. Photo: David H. Ramsey. 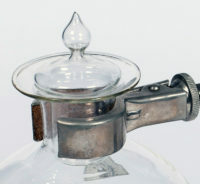 The Sintrax in the Kamm Teapot Foundation contains five parts: a coffee pot, a filter attachment with a lid, a water boiler with a stand and lid, an oil lamp with a wick and cover, and a coffee container. 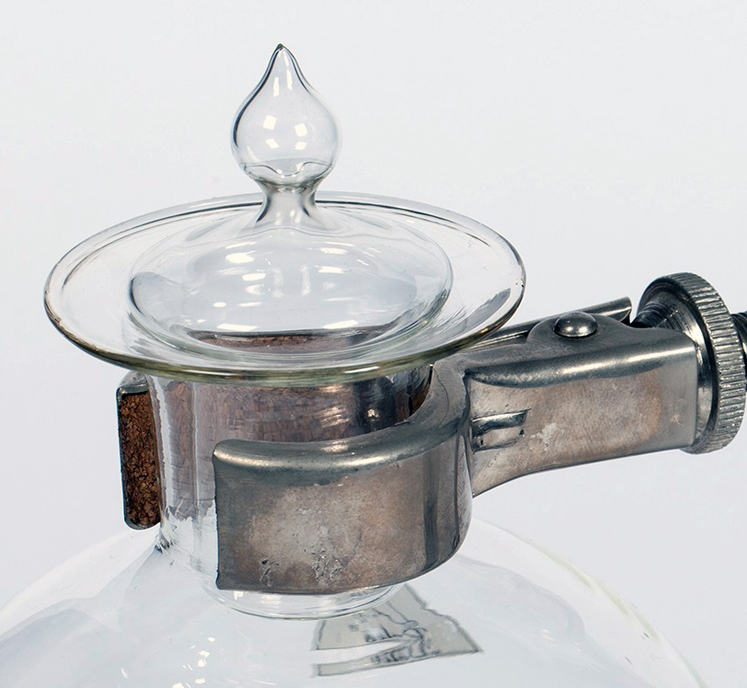 The coffee pot has a short bulbous body with a narrow neck and a flared rim. A black piece of wood encircles the neck and extends outward at an angle creating a handle. 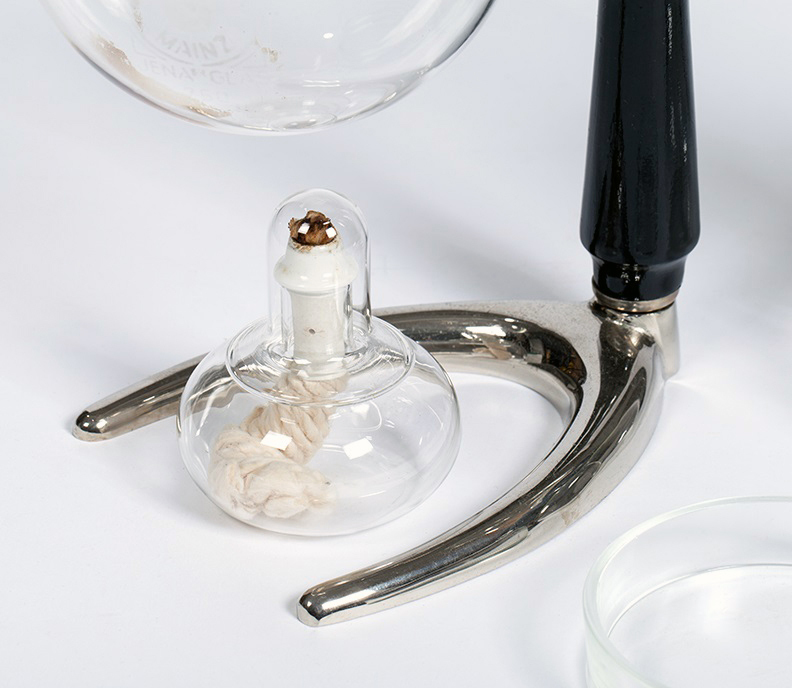 The filter attachment, which is responsible for holding the ground coffee beans, is cup-shaped with a funnel-like tube protruding from its base. At the juncture where the tube initiates, a black rubber collar is present. 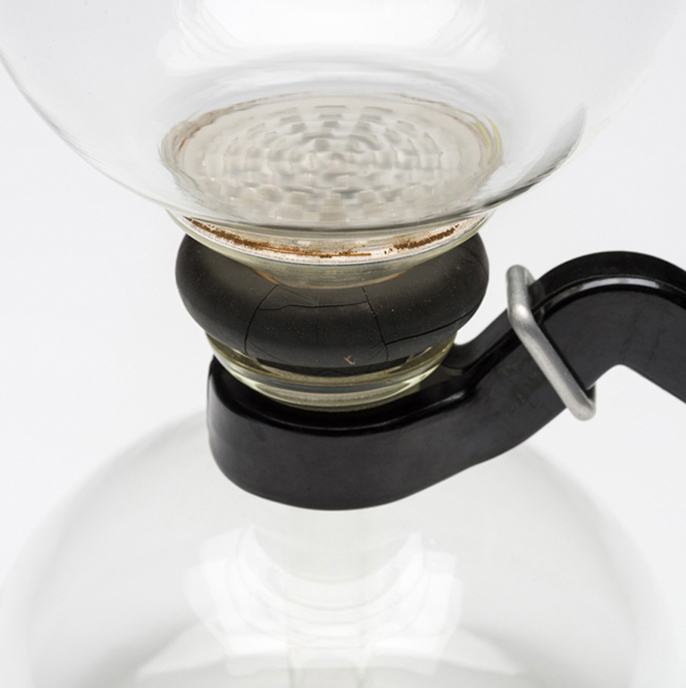 This collar allows the filter to rest inside the coffee pot when the two chambers are combined. The water boiler, like the coffee pot, is a rounded form with a slight neck and flared rim. However, its lid has a tear-drop shaped finial on top. A simple stand with a black grip and clamp holds the boiler in place. When making coffee, the oil lamp is lit and positioned under the water boiler. The final part of the set is a shallow round coffee container that looks almost like a petri dish. In 1932 the Sintrax was revamped by Wilhelm Wagenfeld. Wagenfeld is responsible for basically straightening the wooden handle into a horizontal position. This resolved a discovered flaw with Marcks’ design. It appears that the angled handle, on the earlier version, would occasionally burn when used on gas stoves. The Wagenfeld model was issued until 1939 at which time World War II interrupted production. Although manufacturing did commence after the war, machines like the Sintrax declined in popularity in the latter portion of the twentieth century. This Kamm Teapot Foundation’s Sintrax does not have a straight handle so it does not reflect Wagenfeld’s alteration. However, the water boiler is marked “SCHOTT u. GEN MAINZ / JENAer GLAS.” This could signify that this is a later version of the design produced after World War II. The war caused Schott & Genossen to split apart. There were now factories in two locations. One was in Jena which was in Soviet East Germany and in 1952 another began operation in Mainz, West Germany. For many years both companies called themselves Jenaer Glaswerk Schott & Gen. (Jena Glassworks, Schott & Associates) and produced similar designs. In 1989, after the fall of the Berlin Wall, these two versions of the company reunited. The Sintrax’s designer Gerhard Marcks is primarily known for his sculpture, drawings, woodcuts, and lithographs. His work, which often focused on human and animal forms, has a lyrical timeless quality. Bauhaus founder Walter Gropius stated that “Marcks bypassed the many different ‘art-isms’ of our time…”[vi] Instead, he looked to archaic Greek art as well as Egyptian, Chinese and Indian art for inspiration. From 1919-1924 Marcks was artistic director of the ceramics workshop at the Bauhaus in Dornburg, Germany. However, as the school moved towards creating products for industrial production, Marcks expressed disagreement and parted ways. Following his resignation from the Bauhaus he accepted a position as head of the sculpture workshop at the State School of Arts and Crafts in the Giebichenstein Castle in Halle, Germany. Unfortunately, in 1933 he was dismissed from his post in Halle by the Nazis. Marcks’ work was deemed “degenerate” and he was barred from exhibiting publicly. Like many artists, Marcks suffered when Hitler’s National Socialist Party was in power. Throughout his life Gerhard Marcks doggedly pursued his passion to create no matter the roadblocks. Over the course of his career he produced a large body of work that has received widespread acclaim. In 1952 Marcks was appointed a knight of the order of Pourla le Mérite and in 1971 the Gerhard Marcks Foundation was established in Bremen, West Germany. [vii] Even during his final days when his health was declining, Marcks could be found working on a life-sized sculpture called Prometheus and the Eagle. Kath, Ruth. The Letters of Gerhard Marcks & Marguerite Wildenhain. Ames, Iowa: Iowa State University Press, 1991. Marcks, Gerhard. Gerhard Marcks: A Retrospective Exhibition Organized by the UCLA Art Galleries. Los Angeles, CA: University of California, 1969. Neumann, Eckhard. Bauhaus and Bauhaus People: Personal Opinions and Recollections of Former Bauhaus Members and their Contemporaries. New York: Van Nostrand Reinhold, 1993. 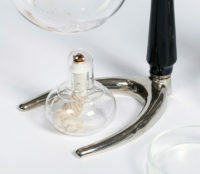 [i] In 1884 the glass chemist Otto Schott partnered with Ernst Abbe, Carl Zeiss, and his son Roderich Zeiss. They founded the Glastechnisches Laboratorium Schott & Genossen, which would later become Jenaer Glaswerk Schott & Genossen and then Schott AG. Other names associated with the Schott & Genossen include Mainz Schott, Jena Glas, Schott Glas, Saale Glas, and Schott & Gen.
[ii] Beate Manske, ed., Wilhelm Wagenfeld (1900-1990) (Ostfildern-Ruit: Hatje Cantz, 2000), 38. [iii] The name Sintrax comes from the joining of the words sintering and extract. These words describe certain processes involved in making coffee in this manner. 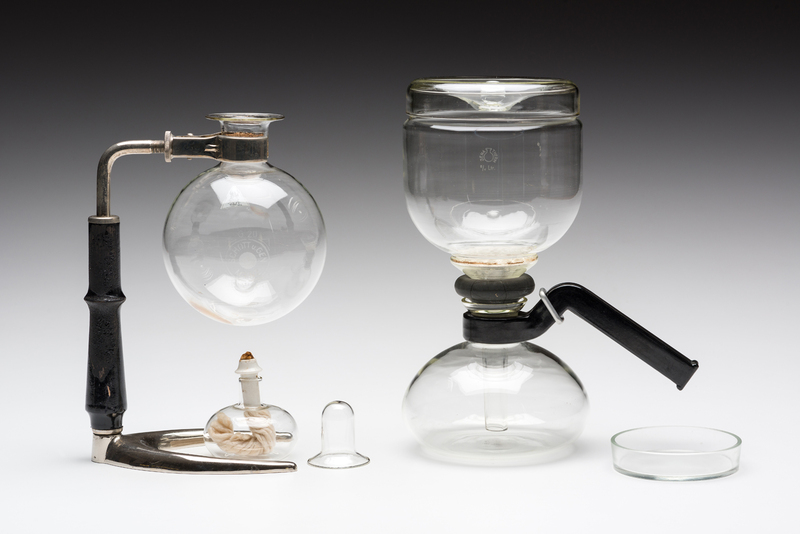 [iv] Invented by Otto Schott between 1887 and 1893, borosilicate glass is distinguished for its high tolerance to heat and a substantial resistance to sudden changes in temperature and exposure to chemicals. Borosilicate glass is a type of glass with silica and boron trioxide as the main glass-forming constituents. [v] Charlotte and Peter Fiell, Design for the 20th Century (Köhn, Germany: Taschen, 1999), 447. [vi] Gerhard Marcks, Gerhard Marcks: A Retrospective Exhibition Organized by the UCLA Art Galleries (Los Angeles, CA: University of California, 1969), 7. [vii] The Pour le Mérite is an order of merit established in 1740 by King Frederick II of Prussia. The Pour le Mérite was awarded as both a military and civil honor and ranked, along with the Order of the Black Eagle, the Order of the Red Eagle and the House Order of Hohenzollern, among the highest orders of merit in the Kingdom of Prussia.